After Refelting (with Speed Cloth) Whoa! How hard is the process of refelting a pool table? Not as hard as you might think… especially if you have even the most basic carpentry skills. Just follow along as we lead you through the step-by-step process, and you’ll be on your way! This site contains instructions and plenty of pictures that will assist you in refelting a pool table properly. The guy who refelted my pool table (Allen) does it professionally and was kind enough to allow me to take pictures while he recovered the pool table with new felt. 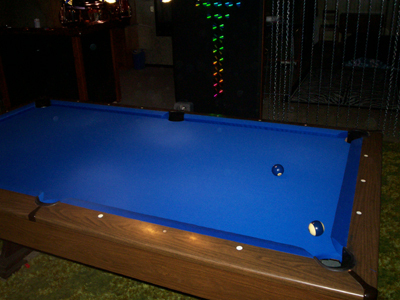 It cost me over $800 to have my pool table recovered with new high-speed felt, replacing the pool table cushions, leveling the pool table, and new pocket liners… since I couldn’t find a decent website that explained how to do it myself, I thought I would create one so that all of you could save some money by refelting your own pool tables. I was also rather intimidated by the idea of refelting my own pool table because I certainly didn’t want to mess it up. After seeing it done first-hand, I can assure you that refelting a pool table isn’t nearly as difficult as you might think. Especially if you’re only refelting the bed of the pool table. (The cushions are the most time consuming part of the process, but they aren’t that difficult either). Check out the pictures, read the captions, relax, don’t rush, and pay attention to detail as you go. You’ll end up with a beautiful pool table that you can be proud of and you can save lots of money. 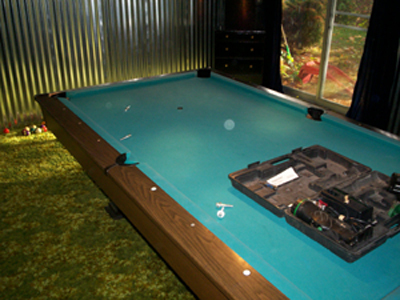 Below is a picture of our pool table as it looked before it was recovered. We got this pool table with the house we bought in 2004. The house and table are both from 1974. (Check out the carpet – ugh!). So this table was just over 30 years old when we moved in! It is still in great condition though and it seemed to make sense to refelt the table as opposed to spending the money for a new one. Not to mention trying to re-home for this one. We’ve been slowly remodeling as we can afford to, and probably should have replaced the game room carpet before refelting the pool table, but the carpet we want is pretty expensive. The pool table seemed more important at the time – and still does!